Remember the unique rules: The Dodgers can take 30 players to Australia, not including three exempt players who will stay behind but remain eligible for the team’s domestic opener March 30 at San Diego. Five of the 30 only travel as potential injury replacements and otherwise wouldn’t be on the active roster for official games. Below is the roster. Some notable additions include pitching prospects Red Patterson and Zach Lee. As noted by the @Dodgers on twitter, either Red or Zach is expected to make a start against the Australian National Team. Also, recent Rule 5 Draft Pick Seth Rosin is heading to Australia. If he doesn't make the club, then he has to be offered back to Philadelphia, so his inclusion may very well be a positive sign for him. Oh... And for your enjoyment, watch the below video of some Aussie lads singing 'Take Me Out to the Ball Game'. GETAWAY DAY: The Dodgers conclude their Cactus League slate this afternoon against the Rockies in their final tuneup before departing for Australia. The club will depart from Phoenix around midnight tonight and touch down in Sydney around 10:00 a.m. local time on Tuesday. 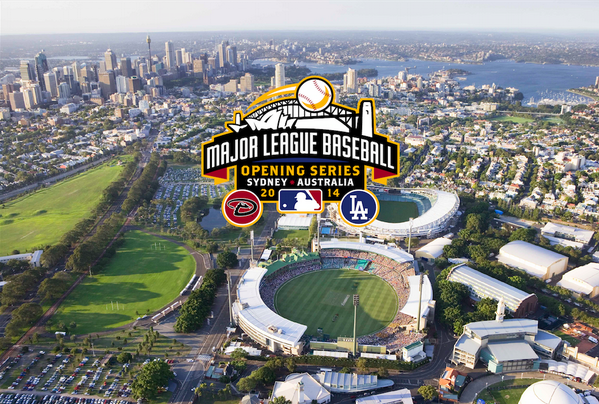 Following a few workouts, the Dodgers will take on Team Australia in an exhibition on Thursday night before playing regular season games against the D-backs on Saturday night and Sunday afternoon. 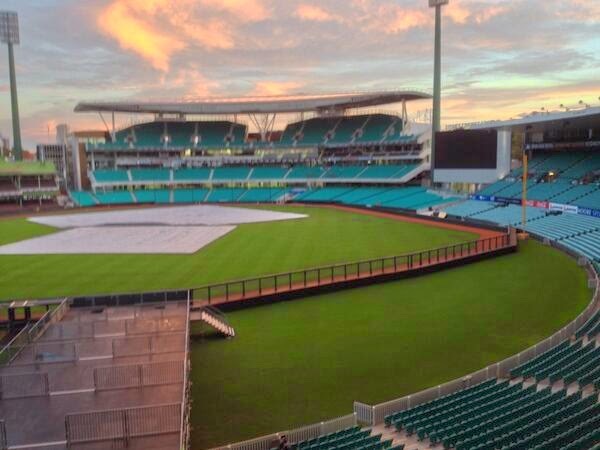 All games Down Under will be played at the historic Sydney Cricket Ground, which has been undergoing renovations to prepare for the first-ever MLB regular season games to be staged in Australia. Clayton Kershaw will be the Dodgers’ Opening Day starter for the fourth consecutive season and has not allowed a run in his three previous season-opening outings (19.0 IP). The left-hander has racked up 19 strikeouts in his three Opening Day starts against the Giants (2013 – SHO, 2011 – 7.0 IP) and Padres (2012, 3.0 IP, exited game due to illness). Hyun-Jin Ryu will pitch the second game in Australia. 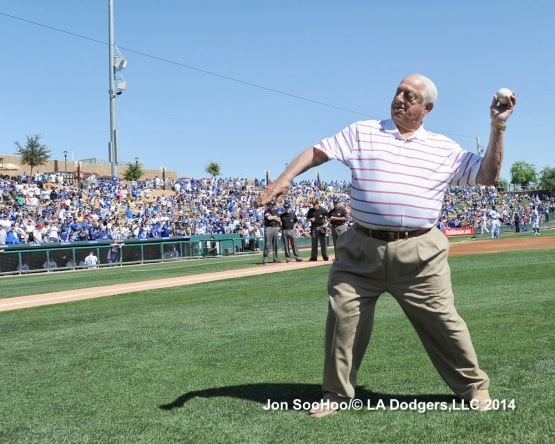 Once back in the United States, the Dodgers will take on the Angels in the Freeway Series March 27-28 in Los Angeles and March 29 in Anaheim and then open the North American portion of the 2014 regular season on March 30 at San Diego. Los Angeles has opened in San Diego three times (1973, 2009, 2012), including two Opening Day victories at PETCO Park. This is the only Spring Training meeting between the clubs and Colorado won the 2013 season series, 10-9. The Dodgers will have six minor leaguers suiting up today, LHP Fu-Te Ni (#84), RHP Rob Rogers (#90), C Jan Vasquez (#87), INF Ozzie Martinez (#88), OF Jamie Romak (#94) and OF Jon Garcia (#89). BIRTHDAY BOYS! : The Dodgers would like to wish relievers Brandon League (31) and Brian Wilson (32) very happy birthdays today! ONE LAST TUNEUP: Hyun-Jin Ryu will make his final Cactus League start this afternoon as he builds toward Sunday’s start against Arizona in Sydney. Ryu allowed just one run on three hits in 5.0 innings in his last start against Oakland on Monday and has allowed just three runs in 11.0 innings this spring (2.45 ERA), while limiting opponents to a .220 batting average (9-for-41). The left-hander, who turns 27 on March 25, was selected to Baseball America’s All-Rookie team in 2013 and ranked among the top big league rookies in wins (14, T-2nd), winning percentage (.636, T-3rd), ERA (3.00, 2nd), strikeouts (154, 4th), innings pitched (192.0, 1st) and starts (30, T-3rd). His 14 wins tied with Kazuhisa Ishii (14-10, 2002) for the second-most by a Los Angeles rookie behind only Rick Sutcliffe’s 17 Ws in 1979. Kenley Jansen will go back-to-back for the first time this spring after walking one in a scoreless inning yesterday against the Padres. Jansen has surrendered just two hits and struck out six in 6.0 scoreless innings this spring. Chris Perez allowed two hits and struck out one in 0.2 innings yesterday against the Padres, his fifth scoreless outing in six appearances this spring. Perez has limited opponents to a .222 batting average in Cactus League play (4-for-18), striking out five and walking only one in 5.0 innings. J.P. Howell retired the only batter he faced, Yonder Alonso, to get the Dodgers out of a third-inning jam yesterday against the Padres for his fourth consecutive scoreless outing. Howell has tossed scoreless relief in five of six Spring Training appearances after posting career-bests with a 2.03 ERA, a .193 opponents’ batting average and a 1.05 WHIP, going 4-1 in 67 games with the Dodgers last year. Chris Withrow will make his sixth appearance of the spring today after striking out two in a scoreless inning on Friday against the Cubs. In his first big league action last year, Withrow went 3-0 with one save and a 2.60 ERA, limiting opponents to a .165 batting average in 26 relief appearances. In yesterday’s afternoon game, 17-year-old phenom Julio Urias made his Cactus League debut and retired the side in order with two strikeouts in the first inning to pick up the win. Dee Gordon (2-for-3, SB, 3B, R, RBI) and Miguel Rojas (2-for-3) registered multi-hit games, raising their batting averages to .282 and .462, respectively. Following Urias, Kenley Jansen (1.0 IP), Javy Guerra (1.0), Chris Perez (0.2), J.P. Howell (0.1), Sam Demel (2.0) and Steve Smith (1.0) all threw scoreless baseball. Clayton Kershaw was tagged for five runs on eight hits in 5.2 innings in a loss under the lights in his final spring tuneup. The left-hander fell to 0-3 with a 9.20 ERA in four Cactus League starts. Justin Turner continued his hot hitting and reached base three times, going 2-for-3 with a double, a walk and two runs scored to raise his average to .333 in 15 games this spring.The official minor league slate of Spring Training games began yesterday and Dodger outfielder Matt Kemp played in the Triple-A game vs. Kansas City, going 1-for-2 with a single. Kemp played 3.0 innings in center field and will have a scheduled off day today. WALK THIS WAY: As a team, the Dodgers have been patient at the plate during Cactus League play, drawing 81 walks (2nd, MLB) in 20 spring games. 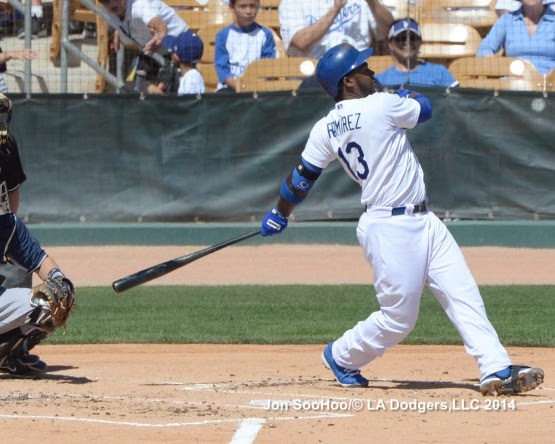 Last year, the Dodgers ranked third in the NL with a .326 team on-base percentage. Los Angeles ranks second among NL clubs with 20 stolen bases this spring, including nine by Dee Gordon, tops in the Majors. Gordon has gone a perfect 9-for-9 in stolen base attempts this spring and the Dodgers, as a team, have been successful on 20 of 22 attempts. 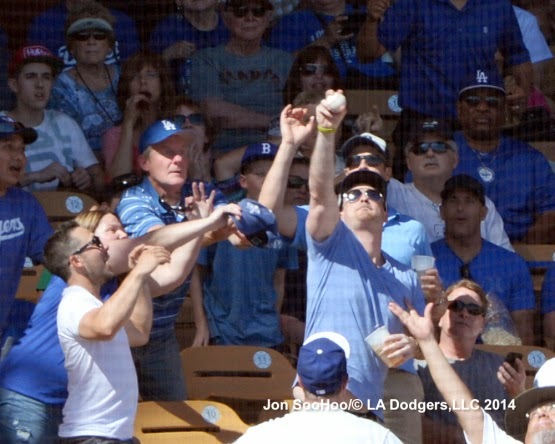 Here are this Sunday's Dodger videos. This was amazing - the Dodgers and Padres interrupted their Spring Training game today and celebrated a 5-year old named Cash Davis who survived a one-of-a-kind operation that got him off a ventilator for the first time in his life. He hit a 'home run' and ran all the way around the bases, high-fiving both teams as they lined the first and third base lines. Phoenix Children's Hospital and the doctors responsible for the surgery were also honored. One time Dodgers Jim Leyritz speaks with Eddie Mataabout his Baseball career; including playing for Don Mattingly. Dodger Nation records Clayton Kershaw speaking after a Spring came. He talks a bit about going to Australia. 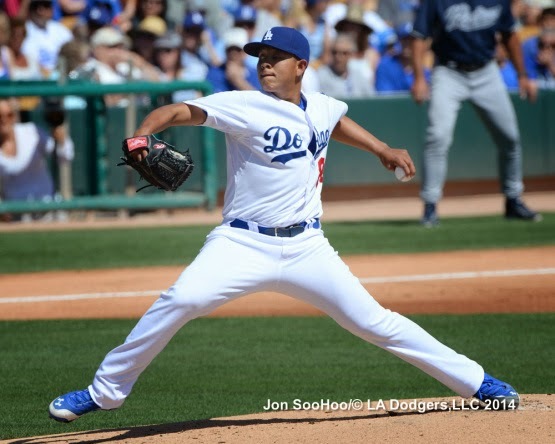 ICYMI: Here's a video from Dustin Nosler of Julio Urias pitching from yesterday.